An excellent update to the X1 that makes a great partner for Traktor Pro. Assignable touch strip. Clearer layout than the old version. RGB LEDs and digital readouts. No included software. Not compatible with iOS Traktor DJ. The original X1 was the first hardware controller from Native Instruments in 2009. It was highly successful, and mainly aimed at those integrating Traktor Scratch into a traditional DJ set-up. High profile users such as Richie Hawtin, Luciano and Dubfire could often be seen using one alongside the CDJs. For the new Mk2 version NI keeps the essence of what made the first version so popular, while updating it to make it better suited to modern DJing. While the X1 Mk2 shares the same form as its predecessor, a number of significant changes have been made. The sturdy and reliable case has been retained, but the rest of the design feels more mature and streamlined, with simpler labelling and a number of refinements. "The middle section has seen a major overhaul, with the addition of a touch-sensitive strip and LED loop-length readouts"
The middle section has seen a major overhaul, with the addition of a touch-sensitive strip and LED loop-length readouts as found on the S4. Finally, the backlit buttons at the bottom of the unit have been upgraded to multi-coloured LEDs to allow for colour-coded cue points and remix decks. As with previous NI Kontrollers, the knobs and buttons all feel sturdy. A new feature for the Mk2 is touch sensitivity for the browse and loop encoders. This automatically shows the full-screen browser in Traktor whenever you touch the browse knob - no need to push it. Buttons at the bottom of the unit have been re-arranged, with the addition of larger cue and play controls which are more familiar to those coming from CDJs. A flux mode button has also been included. The result of this however, is that only four cue points can be accessed at one time. DJs who use all eight cue points simultaneously will have to do some re-mapping. "In action, the unit feels comfortable and well proportioned"
By default the new touch strip is used for cuing when paused and for pitch-bending when playing. The range can be adjusted, and the strip can also be assigned to effects or loop controls. It works nicely for track searching, beat matching, basic scratching and spinbacks, but doesn't feel as natural as a jog wheel or turntable. In action, the unit feels comfortable and well proportioned. NI have done well to pack so much functionality into such a compact package. While there are a few features which require the use of the shift button, most of the controls are well thought out and intuitive. 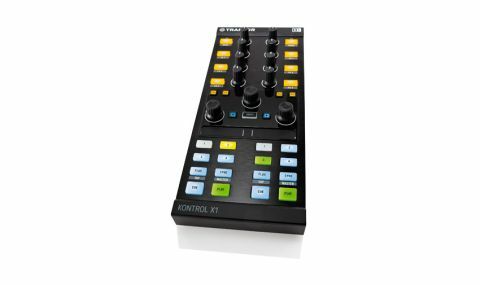 The X1 Mk2 can also be MIDI mapped for use with software other than Traktor. It is a shame that no software is included and that the X1 is not compatible with Traktor DJ for iOS, but otherwise this is a very well designed controller that will no doubt find many fans.